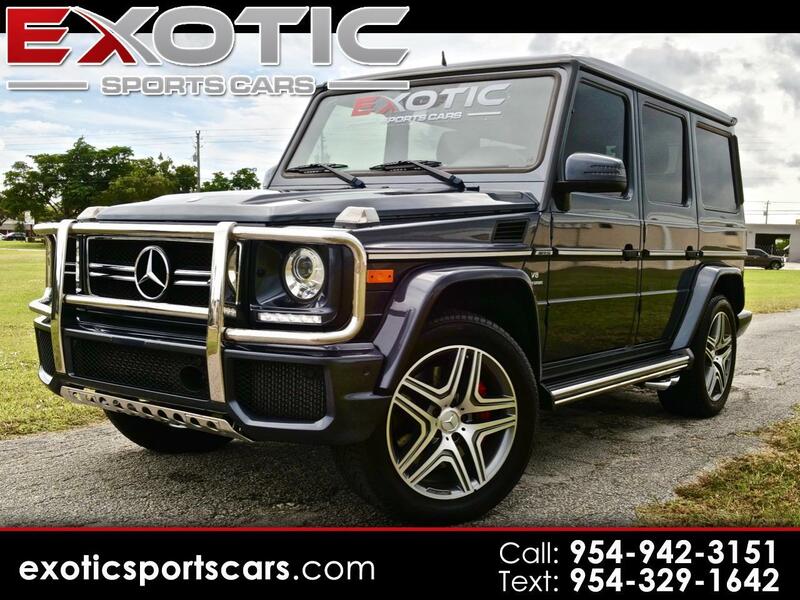 Exotic Sports Cars is very proud to present this immaculate 2015 Mercedes Benz G63 AMG. This Designo Edition features a Dark Steel Gray Metallic color perfectly complemented with its beautiful two tone black with sand interior. The G-class was developed as a military vehicle from a suggestion by the Shah of Iran (at the time a significant Mercedes shareholder) to Mercedes and offered as a civilian version in 1979. It is one of the longest produced Mercedes-Benz in Daimler's history, with a span of 35 years. This midsized SUV is guaranteed to never go out of style. The G63 comes with the AMG SPEEDSHIFT PLUS 7G-TRONIC transmission and an ECO start/stop function and an AMG sports exhaust system. Furthermore, the suspension/damper settings are adjusted for more dynamic handling characteristics, by using optimised bearings for the automatic gearbox, transfer case and engine, cutting vibration and noise levels. It has AMG 5x2 spoke 9.5x20-inch titanium-grey-painted light alloy wheels with high-sheen finish and 275/50 R 20 tyres, AMG high-performance brakes 375x36 millimetres front and 330x20 millimetres rear discs, six-piston fixed front brake calliper from the ML63 AMG, single-piston floating rear caliper and red brake caliper colour. The readjusted ESP includes automatic control systems such as the start-up assist and a HOLD function with optional trailer coupling. It has a twin-blade radiator grill with four chrome inserts, an AMG bumper with three airflow inlets and high-gloss chrome stainless steel inserts, new LED daytime running lamps below the bi-xenon headlamps, stainless-steel running boards and side protective strips with stainless-steel inserts, AMG instrument cluster with colour TFT screen, AMG main menu and separate gear display, plus white-lit AMG sills on all doors, E-SELECT shift lever from SLS AMG, and "designo" leather upholstery with ruffled leather door paneling.